It doesn’t really matter which version of Outlook you have, you can use it for more than email (indeed, this applies to just about every email/calendar/to-do application out there) and keep stuff clean, paid and current. Years ago I used to keep up with annual stuff (like physicals, vet appointments, car registrations), seasonal stuff (air filter changes, fire alarm batteries) and even weekly and monthly things using either a paper calendar or index cards. I quit doing that several years ago and switched to using Outlook so I wouldn’t have to think about things until they came due. Cleaning – daily, weekly, monthly and seasonal. I do them individually by room or section of the yard so the actual task is smaller and I get to check off more things. Goals and resolutions – a few years back I quit making a huge list of big annual resolutions and make 12 per year, 1 per month. Errands – I have a weekly task for grocery shopping in the body of which I add that week’s list. When it’s time to go, print the task and you’re off! Monthly bill/investment reviews – this is different from looking at individual items. Every month I have a different bill type I look at (insurance, phone, cable and so on) and research whether it’s still competitive, useful, new features, features to drop and so on. Once you have your tasks listed, as you do them the first time, open them up and set how often you want to do them. There is a “Recurrence” option that lets you set daily, weekly, monthly and annually as well as whether it resets for after you do it or whether it turns red (overdue). You can also set a time span for that particular task – I use that for things like vacation packing and planning which obviously ends after you finish the trip. Use help in the options to understand exactly how you are setting things up and don’t get all stressed about it, change and modify as you go until you hit the right balance. For calendars it’s even easier – if there is a regular date for it, especially things you tend to forget like that dentist appointment in 6 months or which pet is due for which shot when. There are also recurrence options and alert/alarm options that let you know something is coming up. Of course, also include those things like Aunt Effie’s birthday and the family reunion (and set the reminder enough in advance to get that gift ordered). If you are using an online email/calendar/to-do application, you also have the ability to view and take all of this with you on your phone or tablet so you don’t even need to print out that grocery list or try and remember what that other errand was that needed to be done on Tuesday. It’s right there, you can check it off and bask in the accomplishment! This also lets you add things on the fly as you are thinking of them. Last year I went mostly paperless. This year I was nearly 100% with the exception of medical bills and I still haven’t figured out a way to get those digital nor do I think I ever will without a complete overhaul of the insurance and medical system. As a result, there was nearly no filing other than to put the supporting documentation for what went on the tax form into the “tax binder”. Every year I start with a 1/2″ binder labeled for that tax year – deductible receipts and “important tax information” goes into it as it is received. What I discovered is that I didn’t actually need the majority of my 2012 folders, nor did I need to set up 2013 folders – I did have to set up a CD to save off critical tax records and put a CD sleeve into the tax folder. Shredding is always fun, but I’ve been consistently shredding for some time – the key thing is to know what records to keep and what to nuke. Most people keep things that just aren’t necessary. Example – unless you are claiming a home office, why are you keeping your utility bills? Unless you are running a kennel or showing and breeding dogs is your occupation, why are you keeping vet receipts (other than rabies certifications and pedigrees)? I’m down to one filing cabinet and working on emptying it with the goal of eventually having nothing but my safe deposit box, home fire safe and a collection of CD/DVDs with cloud backups. Truth is – paper is time. You have to organize it, file it, staple it, sort through it, think about it. If no one has asked you for your vet bill from 5 years ago, they aren’t going to – get rid of it. Find an online guide to retention schedules and use it – ruthlessly. Feel sentimental about a piece of paper? Scan it or take a picture. Lighten your load and make it easier to find what you actually need. Free up the time to analyze what you need to do. Paperless is truly excellent – save what you need, let someone else send the reminders (or, if you can afford to, set auto-payments – I do love auto-payments) and focus on how to reduce or eliminate the bills instead of how to store them. In any event – this goal seemed correct in light of previous years, but turned out to be nothing more than a day of shredding and scanning and an afternoon of filling out, signing and mailing the tax returns. I am setting as a follow up goal for later this year to put each major expense category into a month and use that time to check competitors and analyze bills for ways to save money – I’m pretty sure I’ve not squeezed everything out of my bills yet, though I did refinance and change cellular providers this year, which saved substantial amounts and let me pay off two loans and my credit card balances. The major long term goals are to make sure that my son can go through college without coming out with massive debt and that I can retire with a paid off house and a living income. And that still needs some work. Like finding about $1000 per month either through increased income or reduced expenses. Which will be the topic of the next post as I start looking for the soft expenses to cut. Still Catching Up – Yikes! Bill simplification – June is the month for the last utilities budget billing which should finish this off. Bank changes – Need to close the last account and move my safe deposit box and all will be clean, neat and consolidated. And finally – upload all the pictures from the earlier finished goals! It’s the annual shredfest – anything that isn’t needed anymore goes into the shredder. There is a great article on Bankrate on How Long to Keep Financial Records that I use as a rule of thumb. If I have any question (or think I might have potential regrets), I scan before shredding. Trust me, once the credit bureaus and IRS deadlines have passed, the house or car has been sold or the account has been closed, you can safely shred away. Notice how many times I said “SHRED”? A good shredder is an investment in keeping your identity safe – if you don’t have one, get one. Total shredded and recycled this month – 6 tall kitchen can bags equalling 2 years, several banker boxes and a filing cabinet drawer. Did I mention that shredding is also therapeutic? Nothing quite like grinding, chopping and cutting (not to mention clearing out) after a stressful day. Small Steps Will Get Me There! In a bit of a strategy change, I started creating one Outlook task with a series of small steps in it that repeated either daily or weekly and then trying to move just a bit ahead on each thing whenever it comes up. It has actually worked out rather well since my list isn’t cluttered with 923704958745 single steps, there is a regular reminder and, as I finish part of the goal, I get to make the task “look shorter”. Basically, my task list looks like this – [Larger Goal]: [Step 1], [Step 2], [Step 3]. Inside the task are all the notes and details and information gathered along the way. If it is something particularly large or complicated, I do a OneNote notebook (Evernote will work as well) with a cloud sync so I can access it from anywhere (like the store when I’m trying to remember why I’m there). As I finish a step, I edit the task (I remove it, you could also strikethrough) – [Larger Goal]: [Step 1], [Step 2], [Step 3]. 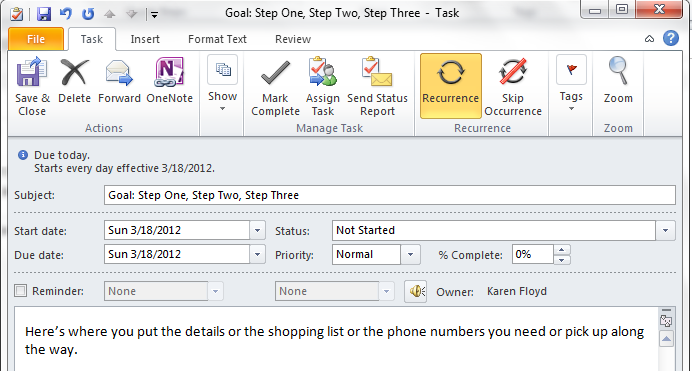 Once all the steps are done, I delete the entire task.